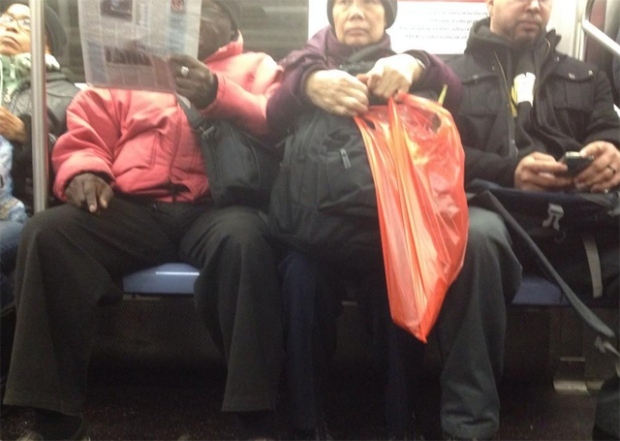 The campaign to stop "man-spreading" has since been picked up by New York's public transit body. The Metropolitan Transportation Authority (MTA) is set to launch a series of public service ads that encourage male passengers to stop infringing on the space of their fellow passengers, the New York Times reported over the weekend. The launch of the upcoming campaign has caught the attention of many public transit users, including those in Toronto who say that "man-spreading" is also a problem in the city. @analyticeye @NYMag I KNOW! Would love if the #TTC could make a poster that illustrates how subway manspreading and nail clipping are wrong. Not everyone, however, is on board with the public shaming tactic. In a Reddit post entitled "Look! 'Manspreading' doesn’t happen only in Toronto!," some commentators called the MTA's campaign "passive aggressive" while others said the ads were unfairly targeting male passengers. "It's basic anatomy," Redditor QuadrilabialTrills said. "Men have some extra bits between their legs that make sitting with their legs far apart more comfortable."